Pretty crummy Grand Wizard when he donates to Al Sharpton and gets praised by Jesse Jackson for minority employment. Plus gets the lowest black unemployment numbers. 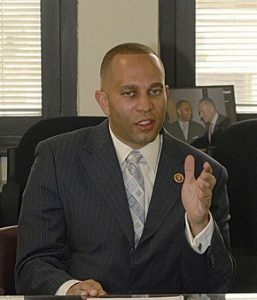 House Democrat Caucus Chair Hakeem Jeffries labeled President Donald Trump “the Grand Wizard of 1600 Pennsylvania Avenue,” a title previously given to the head of the Ku Klux Klan, during a speech honoring Martin Luther King Jr. on Monday. “We have a hater in the White House. The birther-in-chief. The Grand Wizard of 1600 Pennsylvania Avenue. One of the things that we’ve learned is that while Jim Crow may be dead he’s still got some nieces and nephews that are alive and well,” he stated.